I woke a few days ago with a clear memory of an event some 28 years ago, when I was caught – with a group of friends – on Helvellyn’s Striding Edge in a foggy blizzard. It was, without doubt, the scariest moment of my life. 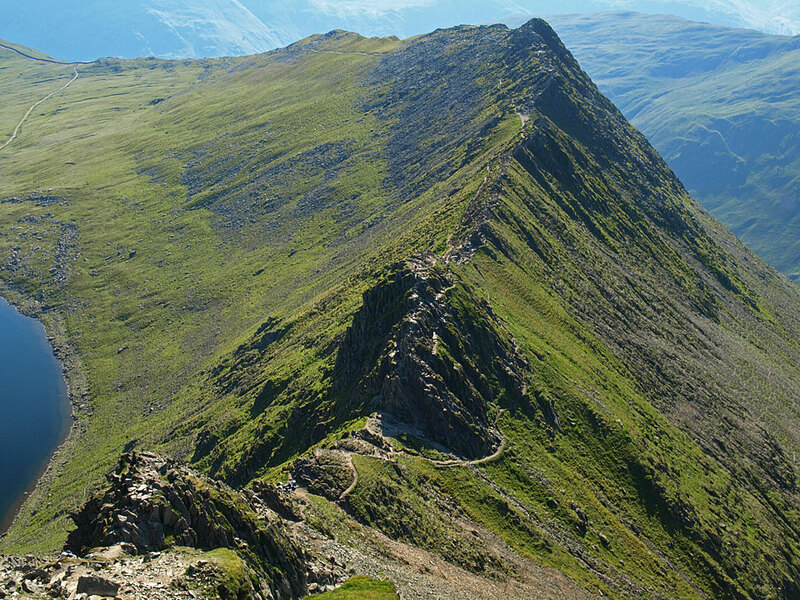 Striding Edge sits, at its highest point, some 2,831 feet above sea level. Anyone familiar with Helvellyn – or hiking/climbing in general – will know the climate up there can bear little or no resemblance to that at ground level, and those choosing to trek ought always to take Sensible Precautions before setting out. The group I was with were seasoned hikers and yet, for whatever reason, we’d set forth on that glorious sunny day to climb Helvellyn sans equipment, and thus were totally unprepared when the bad weather descended without warning. There were perhaps 10 of us – I can’t now recall exactly who was there – equal numbers males/females, all of whom were reasonably experienced and enthusiastic outdoor types. I’d climbed and walked hardily in my childhood. My father is an obsessive adventurer and I was indoctrinated at a very young age to just get on with it – a mantra which has, for the main part, influenced pretty much everything I’ve encountered in life since (thanks, dad). He had me climbing sheer rock faces and crawling through the worst of pokey potholes when I was very young… so I thought I was pretty tough. But this experience on Striding Edge completely threw me – one minute it was beautifully sunny and we were debating which pub we’d head for afterwards, the next we’re blinded by fog and snow, standing on a crumbly path just a few feet wide with hideous life-ending drops at either side. The chaps became very manly. This I remember with a smile. They felt (as they recounted afterwards, when we were safe) very foolish for having dragged us gals up such a nasty mountain without due precaution. They were angry with themselves and set out, with almost-convincing bravado, to guide us safely across. The most experienced guy led, testing each step carefully – we couldn’t see more than a few inches in front of our faces – and instructing the rest of us to follow exactly the footsteps of the person in front. We edged slowly along, it took a long time, it was cold and terrifying, but we got to the end, began to descend and emerged from the bad weather and back into the good. We stopped on the way home at a favourite Italian restaurant – Angelo’s, in Preston – where we took the usual large table in an intimate corner. Ordinarily the wine and beer would flow after a day spent hiking, but this evening we were all too high to drink – we just sparkled, it was a wonderful moment, we were all so very alive – and it was this exact feeling of joie de vivre that I recalled this week when this particular memory came a’haunting. Perhaps it takes a brush with death to make us truly appreciate life. Or perhaps, inside, we’re all adrenalin junkies at heart. Or it could just be that, in the main, our lives are too safe, uneventful, unchallenging, unexciting… perhaps we’re all just a bit too comfy. Maybe we should push ourselves away from comfort a lot more often. Okay, foolhardy equipment-less climbing exploits aren’t sensible, but neither really is the totally safe walk. Why bother? A person could just pace their own garden for a few hours instead. We have to take chances… there has to be a slightly uncomfortable edge to what we do, I think, if we’re to truly feel fulfilled and glad to be alive. Exhilarating moments often brush with death. And you’re spot on, we’re too cosseted these days.